Ever wondered if you were ready to play a high volatility slot? Do you wonder if you have what it takes to conquer the African desert? Well, hang on tight! Because this review will answer those exact questions. First, it’s worth knowing that Raging Rhino is one of those slots that players love or hate, but everyone talks about! Also, that this slot is very volatile and it has 4096 ways to win. Raging Rhino has a unique reel formation and the basic spin will cost you $0.40. So, unless you’ve claimed a bonus or have a good bankroll behind you, you shouldn’t venture into the Savana because the beast is ferocious! Yes, high volatility slots can eat up a bankroll quickly. However, players should know that they’re far more rewarding because of their payouts! Additionally, it’s worth knowing that even if the wins are less frequent they’re far bigger. Available to play at: Virgin Casino, Playsugar House, 888, Betfair, Caesars casino, Golden Nugget, Borgata Casino, Pala Casino, Resorts Casino, Party Casino, Tropicana Casino, Harrah's Online Casino. How to trigger the bonus feature of Raging Rhino video slot? In short, the main bonus feature of Raging Rhino is the free spins bonus game. In fact, if you’re an avid YouTuber you’ve probably seen many big wins of x400 stake or more in online casinos. Not to mention, the ones that have occurred offline. Because yes, Raging Rhino is both available in NJ online casinos and land- based ones. First, you should know that you’ll need 3 blue diamonds to trigger the 8 free spins round. Also, if you land 4 diamonds you’ll receive 15 free spins. Additionally, 5 diamonds will give you 20 free rounds and 6 diamond 50 free spins. Again, let’s not forget that Wild symbols can also multiply your winnings. So if you get 2 Wilds with an x3 multiplier, you’ll actually get a 6x multiplier. Additional Free spins can be triggered with 2 scatters or more. So, you see the winning potential this game has? 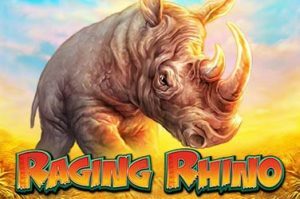 Why should you play Raging Rhino video slot? Actually, even if Raging Rhino is a volatile game, players will still experience frequent wins since it has 4096 ways to win. So, it’s probably one of the less frustrating high volatility slots and even newbies can enjoy it. The soundtrack of the bonus game really helps to build up the excitement! The game has good animations and the zooming reels are a big factor of engagement. African themed games are always fun especially if you like traveling! And if you win the jackpot in this game, you’ll be able to afford a trip anywhere for sure!